Ancient-grain spelt is enjoying a well-deserved renaissance! 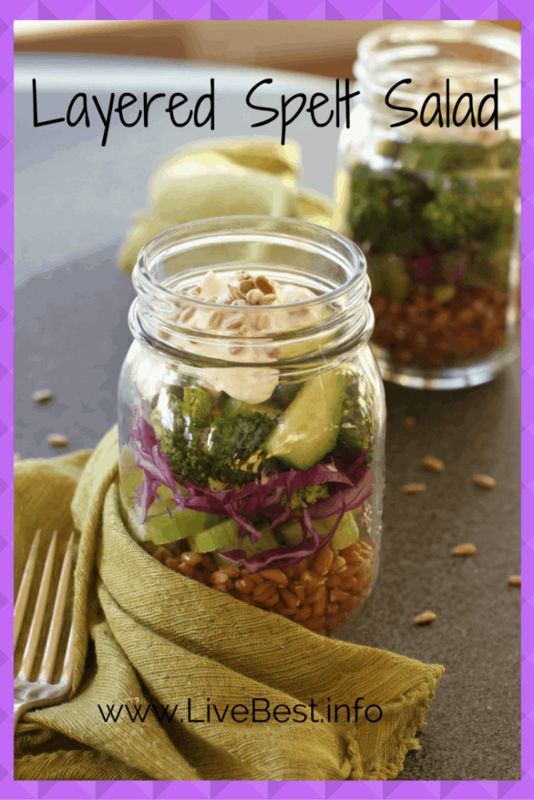 Don’t miss out on all the protein, fiber and chewy texture in the Layered Spelt Salad. 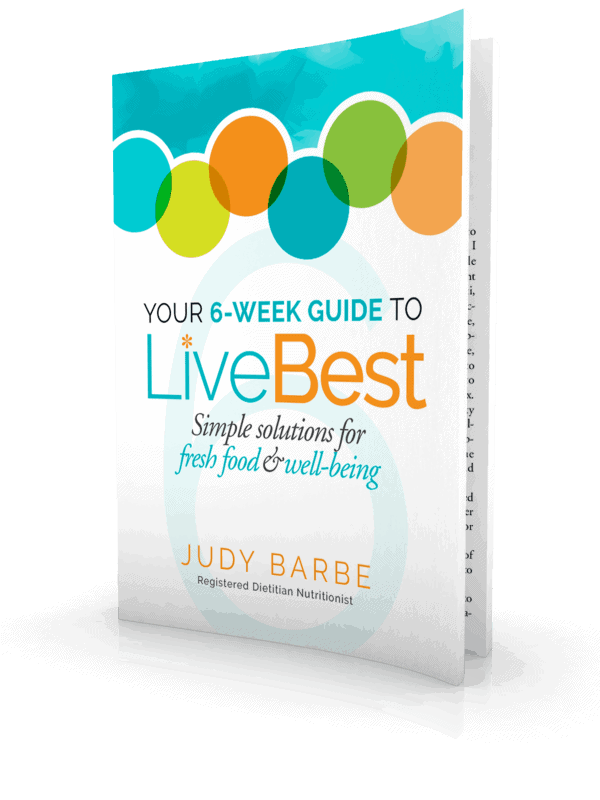 Are you looking for better heart health, improved digestion, or increased energy? Add whole grains to your grocery cart. 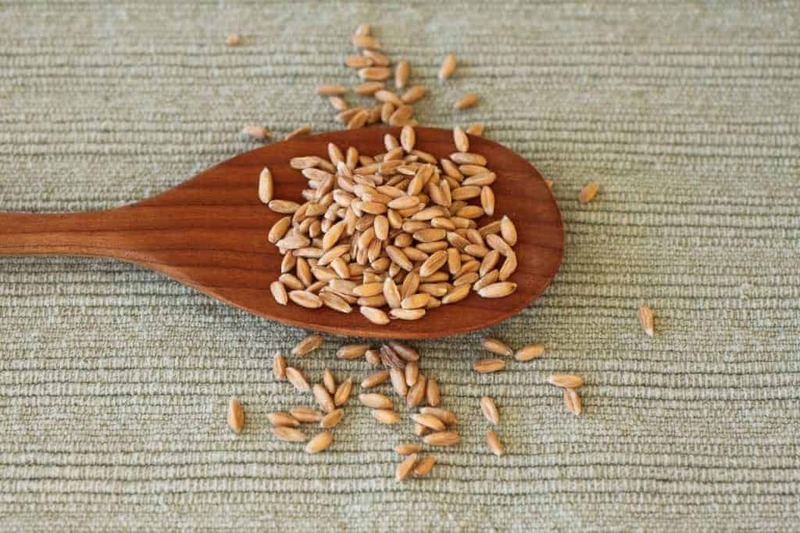 If you’ve heard it once, you’ve heard it a hundred times; whole grains are good for you. It’s their fiber, vitamins and minerals that make them the darling of your plate. Research published in The American Journal of Clinical Nutrition, reported that, compared to those eating only refined grains, whole-grain eaters absorbed fewer calories and burned more calories when at rest. To the tune of about 100 calories. 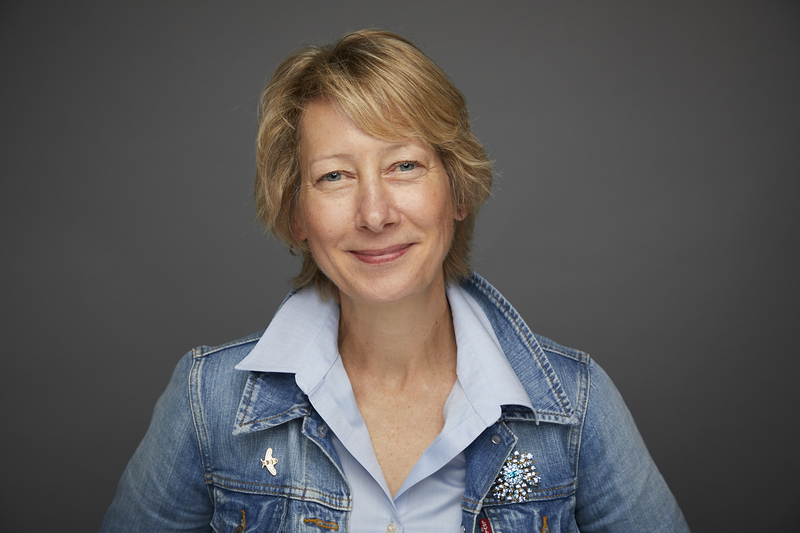 Surveys indicate that more of us want to eat whole grains, but we struggle with how to do it. And how to do it so that they taste good. Not like tree bark, for instance. Though it’s been around for 7,000 to 10,000 years, this ancient grain is enjoying a renaissance. Spelt is a sub-species of wheat. Because of that lineage, it does contain gluten though less than regular wheat. Some people who are wheat sensitive tolerate spelt, but it is not suitable for those with celiac or gluten intolerance. With 19 grams of fiber per cup, this is a grain to think twice about. And then cook it! Spelt is not for the spontaneous. It takes about an hour to cook, though presoaking overnight can shorten the cooking time by 20 minutes or so. Well-drained and covered, it stores for a week, refrigerated. Wrapped tightly, it can be frozen for 2-3 months. But you don’t want to miss out on all the protein, fiber and chewy texture it adds, do you? Substitute for rice in other recipes or serve as you would rice. Add to soups like you might use barley or farro. Top spelt with cottage cheese and toasted pumpkin seeds. Add to green salads or mix with drained white beans, cucumber and tomato or to a salad of mushrooms, artichoke hearts, black olives and vinaigrette. I love the chewy texture of this grain! Spelt’s protein and fiber give it staying power, so you won’t be scrounging for a snack soon after eating. Herbed yogurt dressing is a bit like better-for you Ranch. Crunchy sunflower seeds have healthy fat and protein. I’ve suggested vegetables, but make it easy and use what you have on hand. This is a salad-to-go recipe. Make it the night before and store in the refrigerator. Save time by using the vegetables left from dinner. Cook spelt: bring 3 cups water or stock to a boil, add one cup spelt. Cover the pan, reduce heat to low. Simmer 40-75 minutes (depending on if you soaked it ahead), until the grain is soft but still chewy. Drain off excess water. Store covered in the refrigerator. Can be stored up to a week. Dressing: in a small bowl, stir together the olive oil, yogurt, basil, oregano, salt and pepper. 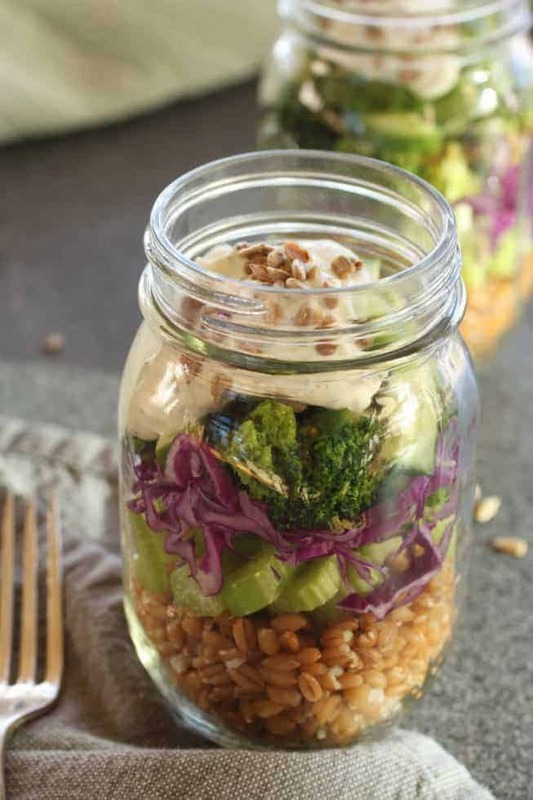 Salad: Layer spelt and vegetables in 2 Mason jars, top with dressing and sunflower seeds. Refrigerate until you’re ready to eat. 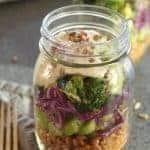 Cooked spelt can be stored a week in the fridge or frozen for 3 months, so cook some while while you’re doing other meal prep to make this salad super easy. Pingback: Crunchy Chickpea Veggie Bowl + Recipe Roundup 3 – Be Healthy!